I have been diagnosed with breast cancer with positive estrogen receptors. 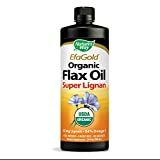 Does flax seed add estrogen to the body as I need to decrease it? I’m so sorry to hear that and I wish you a fast and full recovery. The question you asked is going to be best answered by your doctor, since you have a specific type of cancer. I’m sure your doctor will be able to guide you on what estrogen foods to eat and not to eat. 1. Avoid all refined sugar, since cancer feeds on sugar. Fresh fruit is ok, and very alkaline-forming. 2. Avoid all fried foods. These are damaged molecules that create more oxidation and free radical damage. Choose lightly boiled, steamed or raw instead. 3. Avoid alcohol and caffeine, both of which are acid-forming. Fresh fruits and vegetables are alkaline-forming – that’s what your body needs! 4. Avoid dairy, including milk, cheese and yogurt. There have been studies done showing rates of breast cancer increase in countries like Holland, which have a very high dairy intake. 5. Reduce wheat. Choose whole organic gluten-free grains such as quinoa, brown rice, buckwheat and millet, bringing variety by rotating these throughout the week. Think variety and rainbow colors in your diet! 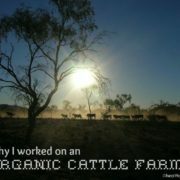 Choose organic whenever possible. Fresh is always best. i have acne problem,should i take flax seed powder ? Yes, taking ground flaxseed can help bring added fiber into the diet. For acne, it’s much more important to focus on what foods to AVOID…you especially want to avoid refined sugar, sugary drinks, fried foods, processed foods, and alcohol. Eliminating these foods helps greatly to reduce inflammation. 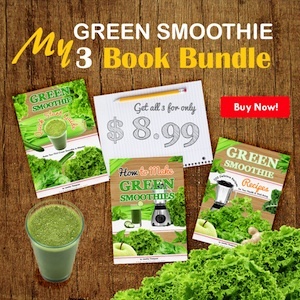 Moving forward, focus on bringing in more fresh organic fruits and veggies..and flaxseed too! I need to lose my weight. 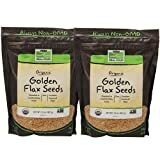 How should I take this flaxseeds daily? Take 2 Tbsp. 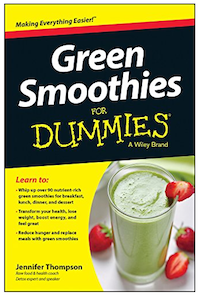 of ground flaxseed in a green smoothie for breakfast daily. That’s a great start for a weight loss plan. Once you get comfortable and committed to having a healthy breakfast, then you are ready to change lunch and dinner. Exercise helps greatly too of course! Mix the flaxseed with filtered water, then add a fruit like organic papaya or banana, and blend in a blender. 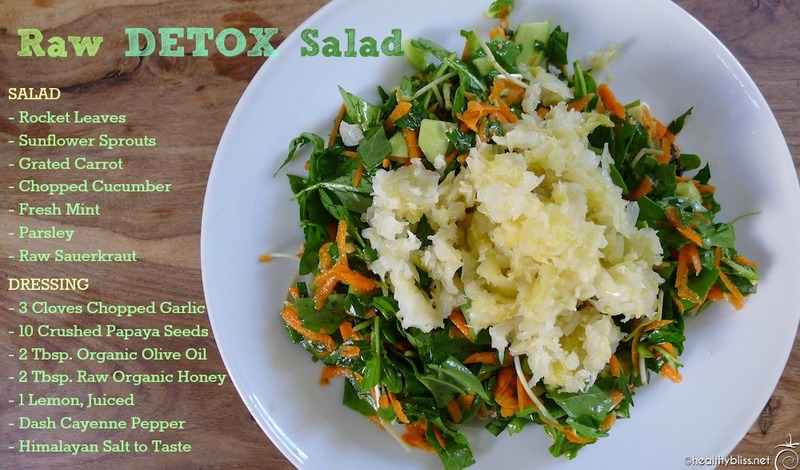 The added fiber will help fill you up and balance your blood sugars. If you want to lose weight, stop drinking milk. It’s also helpful to stop eating all refined sugar, limit your carbs, drink plenty of water and exercise daily. Aim for 30-40 minutes of cardio at least 4 days per week at a minimum. To be honest, working night shift won’t make things easy for you. 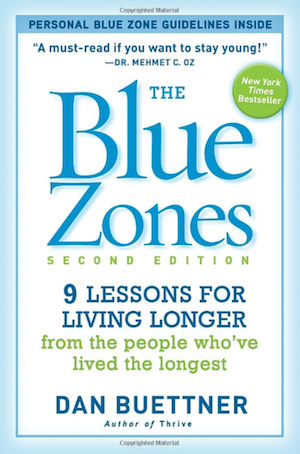 The stress on your adrenals can start to lower your metabolism. To help your body through this, you may want to take added Zinc and Magnesium daily as supplements. Good luck! Jennifer kindly let me know what is the main food i need to take in daily basis to keep my body fit so that i can follow your suggestions and im a residence of India living in Hyderabad according to that suggest me please …waiting for your prompt suggestions .. This article might want to stress the importance of consuming LOTS of water throughout the day. Ground flaxseed without sufficient amounts of water can clog you up worse than before you started taking it. Good point and should be clear that EVERYONE needs to be drinking more water throughout the day! In 20 years of working with clients on natural health and healing, I never had one client who was constipated from adding ground flax seed to their diet. But bread? Meat? Dairy? You bet! People eating processed foods tend to drink less water (in my experience anyway). Or they drink carbonated beverages or more coffee, which of course are dehydrating! Drinking water is so important for the colon, kidneys, skin and circulatory (lymphatic) system. That’s a good way to teach,am happy reading this place,thanks a lot. What you doing is a selfless service to fellow humans. Hai, I am having a huge packet of flax seed powder from US .i kept in refrigerator. How long I can use it. I would recommend to focus on using your flaxseed every day and it will all be eaten long before it expires. Add 2 Tbsp. to a smoothie or juice daily. If you use it every single day, you will not have to worry about any expiration as it should be gone pretty quickly. 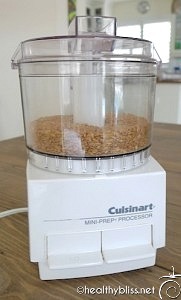 When I grind fresh flaxseed at home, I make about a 1-2 month supply at a time and store it in the freezer. I started taking 1 teaspoon for 1st 20 days thrice a meal or at least twice. I had roasted the dark brown flax seed found in mumbai and consume 2 teaspoon after 3 times a day immediate after heavy breakfast, lunch and dinner. I chew the seed thoroughly. Let’s see the benefits. Dear Jennifer I am suffering from severe cervical spondylosis. I am unable to bend my head downwards, not able to write for more then 5 mins, My work needs driving motorcycle/bike for atleast 1 hour daily. I am into sales. It’s a severe pain. Standing for few mins causes so much pain on my legs and whole spine i may not be able to explain you. Doctor’s say stop riding bike as the roads are very difficult here, but I have no choice but to commute on the byke. What’s your advice ?? I’ve been through this constipation problem and got relieved through this flax seed. I’ve used raw and roasted forms of flax seed. I used to have it after each meal and don’t forget to drink plenty of water as they will help flushing out the waste matters. Thanks J , i am confident after i read your knowledge of Flax seeds. I’m 81, male, Indian, Bengali. I’m having pain in knees, wrists & all joints, also in the thigh, calf muscles, almost all over the body. Pl. help, preferably home cure. I’m curious if the fact that the oil in ground up flax seeds in dispersed in that massive amount of smily mucilage reduces the body’s ability to effectively absorb it. I wonder if it isn’t better to eat the oil alone and swallow the rest of the seed separately, later. I am looking at a nifty hand oil press to separate it out, and wondering if I need to. Any opinion? Think the oil gets trapped by the slime? I just blended some up with a lot of water and can see the slime issue will not be an issue at all. I am remembering the days when I used to chew them up, and that was some seriously thick stuff. With more water, it’s quite runny and I can see the oils should be available. I feel so much better about taking it. If you cook flaxseed in your food will that take the nutrients out. I m a insulin dependent diabetic and undergone by-pass surgery in 2009. Constipation and frequent bowl movement is my other problem. Kindly suggest use of flaxseed keeping in view the Indian conditions. 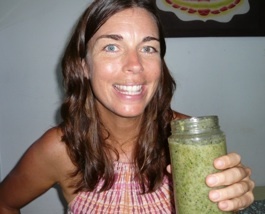 I have been adding 1 tablespoon of organic flax seed (which I grind up) to my morning fruit smoothie for 8 days now. I noticed on day 3 that I was not sleeping well, was very irritable, and feelings of being very overwhelmed. It was as if I was having PMS symptoms (which they weren’t because it wasn’t anywhere near that time) that just kept getting worse and worse. I have not been able to relax this week and my husband is worried for me. Then, I made a silly mistake and had a severe crying and anxiety attack. I haven’t had these for years. I used to struggled with severe anxiety, but have it mostly under control now BUT this week was such a regression. I don’t take any medication; except levothyroxine for hypothyroidism and a multivitamin. I exercise, have a healthy low BMI, and am mostly healthy, but I just wanted to try flaxseed for the cancer prevention benefits and to add some thickness to my smoothie. So, do you think this could be the flax seed? I don’t want to think so, but I cannot see what else has changed in my life to make me feel this bad. I don’t have any physical symptoms, just severe anxiety, feeling overwhelmed, can’t sit still, crying uncontrollably, ect. I have taken a couple of my friend’s anxiety pills to help. If it is the flax seed – what about it would make this happen? What else was in your smoothie? 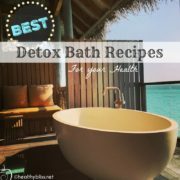 Please list ALL ingredients used and maybe I can try to help then, thanks!! should i roast the flax seed or eat them raw ? You may want to try something like UDO 3-6-9 oil or consider taking a good quality fish oil supplement (since you eat cheese you’re not a vegan in which case fish should be ok). To be honest, you’ve got a pretty long list of imbalance and I don’t think it is all caused by omega 3 deficiency. 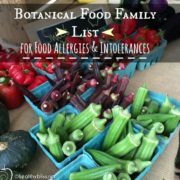 I would guess that you have some food AND food additive sensitivities and also need to work on restoring gut health naturally with some detox and focus foods. In short, you are an excellent candidate for health coaching so you have professional support and guidance and no more wasting time on multiple things that you really don’t need. If this is something that you’re interested in, please contact me and I can tell you more about how I work with people just like you! Can you please tell, for diabetic patients what is the right time to take flax seeds, before meals or after meals? 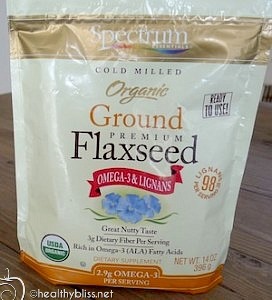 I would recommend the take flax seed DURING your meal, that is ADD it to your food! Whether it be a salad, steamed veggies or green smoothie – you have many options for easily adding ground flax to a meal. That way, you don’t even notice that it’s there and it’s much easier to stay with the habit of adding it. Many blessings to your health! Great article and I have been inspired and started incorporating flaxseed into my diet as a prediabetic menopausal woman. Thank you. However, I have one little issue with your math. 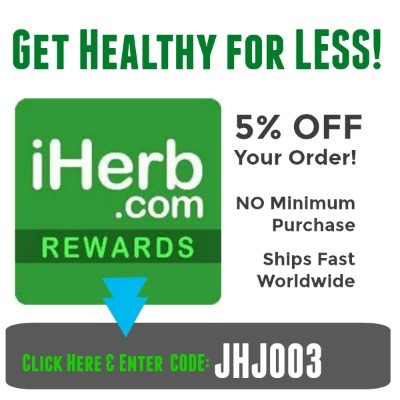 Wouldn’t 4 Tbsp of flax seed be only 8 grams of fiber you’re adding to your diet? Not 16 grams as stated, since there is 4grams of fiber for every 2 Tbsp. just wanted to make sure. Thanks for the inspiring article though. Thanks for your eagle eyes – yes, you are correct! I’ve updated the post to be 8 grams added daily in my example. Wishing you all the very best for a healthy & joyous day! 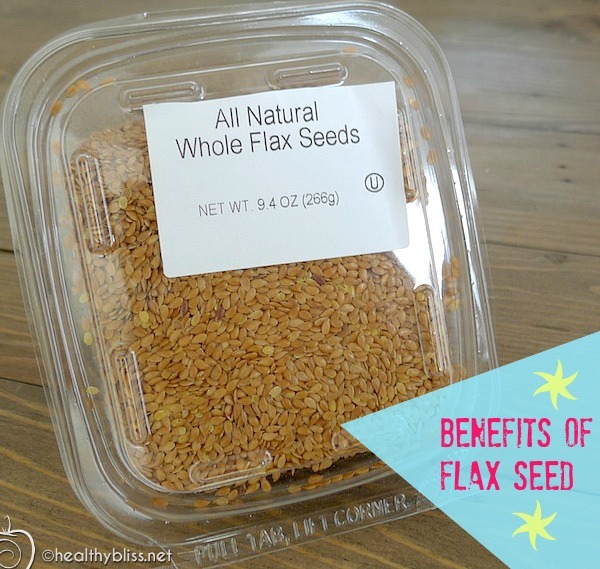 One of the best articles on Flax seeds available online… Very well explained! I totally agreed with you. I feel confident to use the product with ease. Just added freshly ground flax to my oatmeal! We’re only talking about 2 Tbsp. per serving …I think it’s pretty manageable to put 2T into a glass of water, smoothie or juice all at once or 2T into a salad at once. It’s kind-of splitting hairs (or seeds!) to worry about something like “Do I put 1T into water and 1T into salad”? If this is your biggest problem, then you are definitely doing better than everyone else! Why not live on the edge and put 2T into your water and 2T into your salad! Your bowel movements will be epic and that’s a real relief!! Hiiii.. I just brought flax seeds, grind them and stored in the refrigerator.. i have grinded about 200g of flax seeds, for how long can it be stored in the refrigerator?? i have read in few other sites where they mentioned it should be consumed within a week.. i find, its difficult to consume such a lot of powder in a week.. can you suggest for how long can i store it? I usually keep about a 2-4 weeks’ supply of ground flax seed in the refrigerator at any given time; that equates to 2 cups or almost 500ml. If you are using it every day, then your 200ml supply should be finished in 2 weeks anyway. I’d say you’re probably splitting hairs (or seeds!) to worry about it. 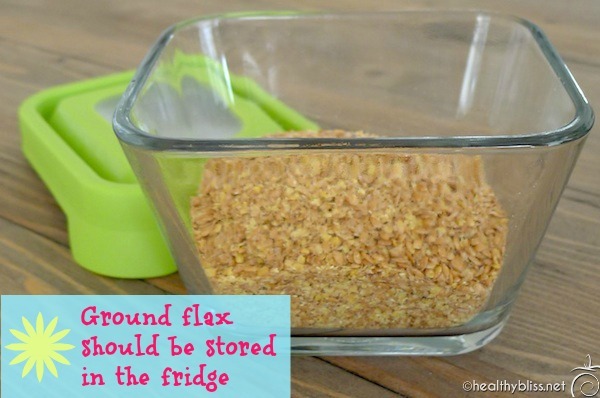 In reality, the ground flax seed can safely be stored in the refrigerator for approximately 3 months. I made flax meal bread today from a recipe I found in the web…it was super easy and a delicious addition to my LCHF lifestyle. This will hopefully help with those cravings for the texture of bread and help me stay regular as well. Ground flaxseed in pancakes is fantastic. I substitute flax for 1/3 of the wheat flour. And, considering how many pancakes my children consume, I feel much better about it now knowing that I’m removing something with mostly starch, and adding something with notable protein and omega-3 fatty acids. I’ve also noticed that the various brands of ground flaxseed have markedly different fat levels, so I check the label more than I did in the past. Hello, after reading your info, I did learn more about flax seed..
what I want to know is, what fruit or veg’s to use with it. Thanks and blessings to your health! 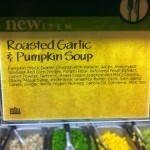 MSG hidden in Packaged Foods: Why I don’t buy 90% of the ‘food’... 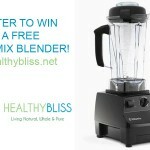 Enter my FREE Vitamix Blender Giveaway here!